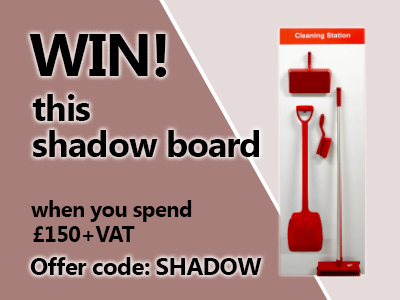 You could be in with a chance of winning one of our great 'A' range shadow boards by simply placing an order with us for over £150 +VAT between 15th April and 31st May 2019. Quote the code SHADOW when you call 0808 278 2499 or use it online at the checkout. These boards help you keep cleaning equipment together and provides an instant way to see if anything is missing. Supplied with all the elements pictured on the board, all you need to do is attach it to a wall and away you go.